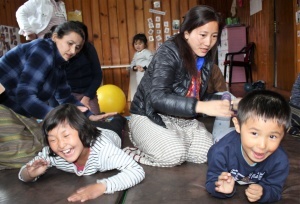 Mrs. Kaushila Nirola, a parent of 7 years old boy with autism volunteers to give an hourly Qigong Massage to the children of ABS twice in a week on Tuesday and Thursday from 4 – 5 pm. She had been giving this massage to her son that observed improvement. Currently her son studies at Changangkha Middle Secondary School. Parents of children with disability shared their positive feedback on massage therapy provided by Mrs. Kaushila in improving their child in terms of reducing constipation and better sleep. ABS acknowledge Mrs. Kaushila’s dedicated service in improving the wellbeing of the children with disabilities.